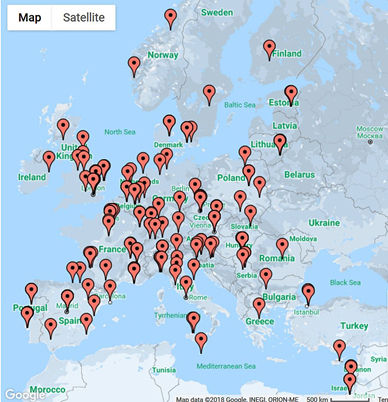 The Association of Resources for Biophysical Research in Europe (ARBRE) is an open pan-European network which aims to bring together academic and industrial research infrastructures, core facilities and resource labs that provide access to biophysical instrumentation and expertise for the molecular-scale characterization of biological systems. It is currently partnered with the COST Action 15126 "Between Atom and Cell: Integrating Molecular Biophysics Approaches for Biology and Healthcare" (MOBIEU) whose website can be accessed here. The network has generated a community focused on broadening expertise and inspiring novel methodological development. It addresses all scientists and technicians who utilize biophysical instrumentation to characterize the intrinsic properties of biological macromolecules and the assemblies in which they are involved. To join us visit our ARBRE-MOBIEU website by clicking here. * provision of access to biophysical instrumentation (and relevant training) for a scientific community. * participation to methodological research driven by biological questions. Membership indicates willingness to share openly with the ARBRE community information about available instrumentation and expertise, as well as tips and protocols.